Previously I mentioned that I was open to other bloggers contributing to my weekly blogging tips series. At the time this offer didn’t generate much interest. I guess as this is mostly a personal finance blog fellow bloggers were more comfortable writing about finance topics. Still, I’d love to hear people’s stance on particular blogging strategies. I know my approach is far from the only approach one can use to succeed. This week’s blogging tip is a guest post from my friend Steve who blogs at Money Infant. I recommend you check out his blog. He has a very interesting story of how he works online full time overseas. Sounds like a pretty sweet lifestyle to me. There has been so much said over the past few years about getting rich as a blogger that the title of this post has almost become a cliché. 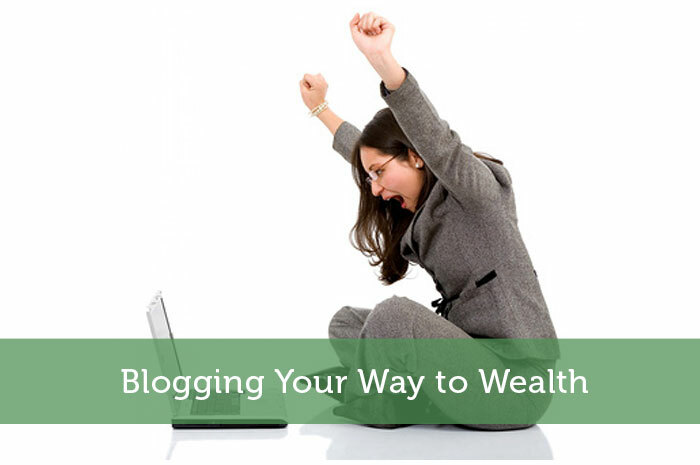 Even so, while the blog-o-verse has become more crowded (Pingdom reports 87.8 million Tumblr blogs and 59.4 million WordPress sites in 2012), and competition is fierce, you can still blog your way to independence if not wealth. One good example of this is Modest Money, and another is my own blogs, which have allowed me to pick up and move halfway around the world to Thailand, where I’ve been living with my family for the past two years. I certainly haven’t blogged my way to riches yet by any means, but in conjunction with some good freelance writing gigs I have been able to replace my prior income from an employer with an income from my own efforts. So, in the face of increasing competition in most blogging niches how does one go about creating money from blogging? While many beginning bloggers may think success in blogging is tied to writing ability, the fact is that even a marginal writer can create a large following and income from blogging. The only real writing ability needed is the ability to present your ideas in a clear and coherent fashion. It also helps if you are able to get into the minds of your readers and give them what they want (note that this may be different from what they need). Even more important than writing ability for bloggers though is the ability to market, especially in the early days of your blog. The build it and they will come days are long gone on the internet and without a solid marketing plan no one will ever discover your blog, let alone become a regular reader. Marketing takes several different forms, and there are a wide number of ways to market your blog. Some are more effective than others, but typically the most effective are those methods that you feel most comfortable with or are good at doing. What are some of these blog marketing techniques? Commenting on related blogs. This is one of the quickest ways to generate traffic and get some followers for your own blog. Simply seek out related blogs and leave thoughtful and useful comments on those blog posts. The author of the blog is almost certain to check out your blog as will some of their readers…who may in turn become your readers as well. Plus it sets the stage for the next marketing technique. Guest posting. After commenting on the same blog several times you may have developed a conversation or rapport with the blog owner. Even if you haven’t, they will at least recognize your name and blog. This is the perfect time to approach them and see if they are willing to accept guest posts from you. Guest posting has become a bit overused in some cases, but if you’ve taken the time to develop at least a minimal relationship with a blog owner they will be much more inclined to accept a guest post from you. They get good free content and you get added exposure for your site. Sidebar links. These used to be effective as marketing tools, but these days I think they have diminished returns. Certainly never turn down a sidebar link, but these days it is of little use to actively seek them out. Some bloggers will add your blog to their blog roll anyway if they like your writing style. And you could always make a blog roll request after becoming a regular contributor to a blog. Paid advertising. Most of us have no budget for paid advertising when starting out, so this is somewhat of an advanced technique. Unless you are in a high paying niche or have a product of your own to sell, this is not something you want to consider until you become somewhat established anyway. Plus, you should be adept at using your analytical data to track visitors and determine your ROI from paid advertising. Social media. Facebook, Twitter, Google+ and other social media sites are great for getting your content shared, however they present something of a double edged sword. When you are just getting started you will have very few followers on your social media accounts, which means they provide very little impact. In fact, you may need to focus part of your marketing efforts on marketing your social media accounts before you see significant results from social media marketing. A bit of a Catch-22, but I never said this was going to be quick or easy. In addition to the active marketing techniques there are a host of other things you can be doing to gain more exposure for your blog including targeting a specific type of reader, creating controversy around certain aspects of your niche, optimizing your blog for search engines, being honest and transparent, and optimizing your blog for your readers. Whew! Seems like a lot of work huh? Well, it is and it will also require a lot of learning on your part. Technical learning about your blogging platform, marketing learning to get your blog brand in front of as many people as possible, writing learning to improve your posts and the impact they provide, and search engine optimization learning for more long term organic traffic. Don’t let the amount of work discourage you from blogging though. When you consider that many people take four years to complete a college education only to graduate and start a career at dismal wages (if they can even find employment), blogging begins to look more attractive. While I can’t guarantee success, I would be willing to bet that a person who puts four years of consistent effort into developing and marketing a blog will be making considerably more after that time versus a new college graduate. It may not be wealth from blogging, but that level of effort can most certainly provide a living wage, and it’s fun besides! Author Bio: This has been part of the blogging tips series and was contributed by Steve Walters from Money Infant.com. Steve has been blogging since 2006 and has been able to use his blogging success to create an independent lifestyle, moving with his family to live in Thailand for the past 2 years. Really like this post! Its gives people what they need to make it work online but sadly many will look for those killer shortcuts the will cause failure. Marketing is honestly number one on the list with great content. Just writing great stuff with no readers doesnt make for much of a blog. Remember it takes time to get to the point where a lot of other sites are. I agree Thomas, most people are just looking for the shortcuts and don’t have the patience to wait for their blogs to fully develop. If you are willing to do the work and wait 3-4 years for the return you can almost certainly become successful. That is indeed a lot of work, I am always impressed by guys like Pat Flynn who make it look so painless. The learning period can be fast but you have to be willing to put in the hours and generally at the beginning you won’t even make a minimum hourly wage. The guys like Pat who make it look easy have typically been doing it for years already, that’s why they can make it look so easy! If you love the writing aspect, the communicating with others and the community building then there’s no better ‘job’ than blogging. CONTENT CONTENT CONTENT! Be interesting! Have appealing content! Don’t be gimmicky or clever. Don’t steal someone else’s ideas. No, you don’t have to be an amazing writer but you have to be interesting. Do all the marketing bs you want but if you’re blog is boring, you won’t keep readers. I think the need for interesting or highly informative content goes without saying. I am certainly jealous of you being able to live overseas. I have taken advantage of blogging full-time as well, but at a much smaller level. My wife and I have spent a month in Europe, but I would love to spend a year or two. If you are already taking advantage of blogging full time (even on a smaller level) then I congratulate you on your success! If you truly want to live in Europe for a few years I say make a plan and go for it! The biggest misconception people have is that blogging is easy. While, it is not technically difficult to setup a blog, it is not for everyone. Marketing is a huge part of it and that needs to be done in order to increase your visitor count and all the other metrics that are involved. It is also sooo easy to get attracted to that great new shiny thing. I think too many get distracted and don’t give their marketing efforts time to work. If they don’t see results within 30 days they are moving on to the next great thing so they never really see the results. Consistency is definitely one of the keys to great blogging. Like others have said, blogging definitely does take a lot of work…if you allow it. I think that’s a big part of the reason why so many give up early on. It can be worth it over time, but you have to have some patience. Like Grayson said above, it is technically pretty easy to set up a blog, especially if you aren’t self-hosting. It also isn’t too time consuming to write (if you enjoy writing that is). The real time consuming part of blogging comes with the marketing and outreach. Thanks for the compliment! Reading and always learning are certainly important to bloggers, or anyone looking for success in a given field. Hope my contribution didn’t disappoint Cat! Thanks for the great post Jeremy (and Steve). I love this series! Glad you liked the post Nick and I’m sure Jeremy is very happy you love the series! That’s really great that you were able to replace enough income to move overseas. I think you’re right that anyone could do it if you have the right voice and know how to market. While I can’t ever see myself doing online work full time, it is fun and a nice supplement. I won’t say it was easy or quick, I worked long hours for nearly 4 years to make it happen, but the end result was so worth all the effort. And I agree with you that a bit of good marketing combined with the right voice will nearly always be successful (I say nearly because nothing is guaranteed). Just out of curiousity, how did you wind up in Thailand? It seems like an interesting, yet out of the way, place. Hi Terry! Thanks for asking. I’m not sure that it’s all that out of the way, especially as Asia is concerned. Bangkok is something of a jumping off point for much of SE Asia, and sees over 20 million visitors a year. The Thai economy has been quite vibrant of late and the expat population here continues to grow. As to how I ended up here…well that’s a long story that began way back in 1997. Ultimately though I ended up married to a Thai national and since I love the country and she obviously was interested in being closer to friends and family we made the choice to pick up stakes in the U.S. and head to Thailand. We’ve been here for 2 years so far and have no plans to leave anytime soon, though that could change based on the needs of our (now 3 year old) daughter. Thanks Andy, glad the post resonated with you. I’m still a huge fan of your WordPress plugins post. I’m surprised there is such a gap between WordPress and Tumblr accounts, but I suppose the latter deals more with social networking as well. Backlinking still works as long as you do it as organic as you can. And right now, it’s all about contents, that’s why guest posting is so popular. Backlinking is still a great way to get organic traffic, but it is a long term strategy and needs to be carried out carefully these days in my opinion. You’re right that “build it and they will come” days are largely over. Granted, with everyone’s busy schedules – especially life outside of blogging – it is increasingly difficult to find time to market. Lately I have begun commenting on more blogs and every so often guest blogging. In the first year of blogging I never did that. It has helped my traffic stay very consistent each day, with a solid percentage gain each week. The one element that I believe will push me over the edge as far as marketing potential is concerned will be that differentiating element. This could be a contest, an ebook, giveaways, video series, etc. I have also found that commenting on other blogs can give a very consistent and slowing growing source of traffic. It is still fairly time consuming though. Guest posting tends to give more traffic spikes, but also contributes to long term traffic, both from the post itself and from the SEO benefits. I agree with you that if you can find a differentiating element all your marketing efforts become much more effective. Wow great article! Some very good tips there that I’m going to have to implement. Hehe. I just recently started my own blog because I wanted a creative outlet for writing. Making some money wouldn’t hurt either. Please keep writing about blogging! Thanks Christine. You might not get wealthy from your blogging, but having some extra cash sure is nice. And who knows where it might take you! Reading your post seems blogging very promising. But why people go with freelance most of the time is because they need instant success. Anyway, I want to ask you that , can I write for article directories to get backlinks ?